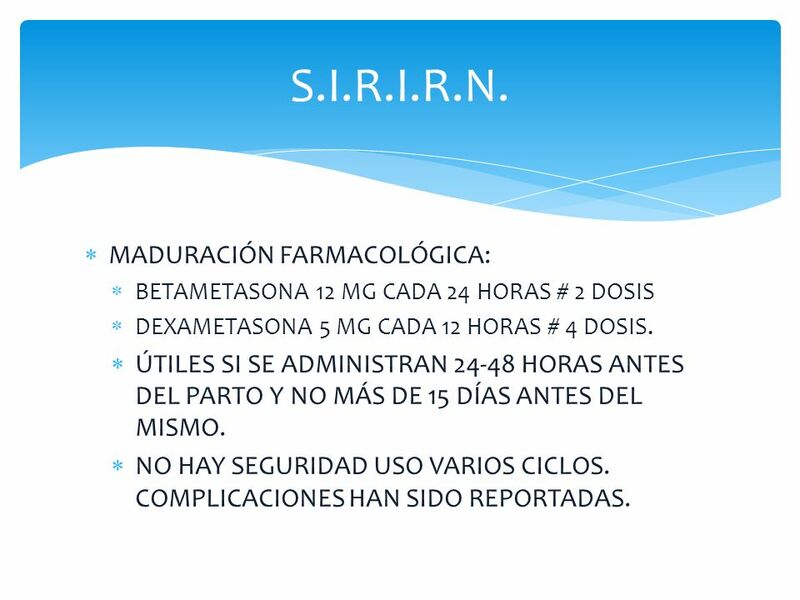 2 S.I.R.I.R.N. CAUSA MORBILIDAD MÁS FRECUENTE EN UCIN. 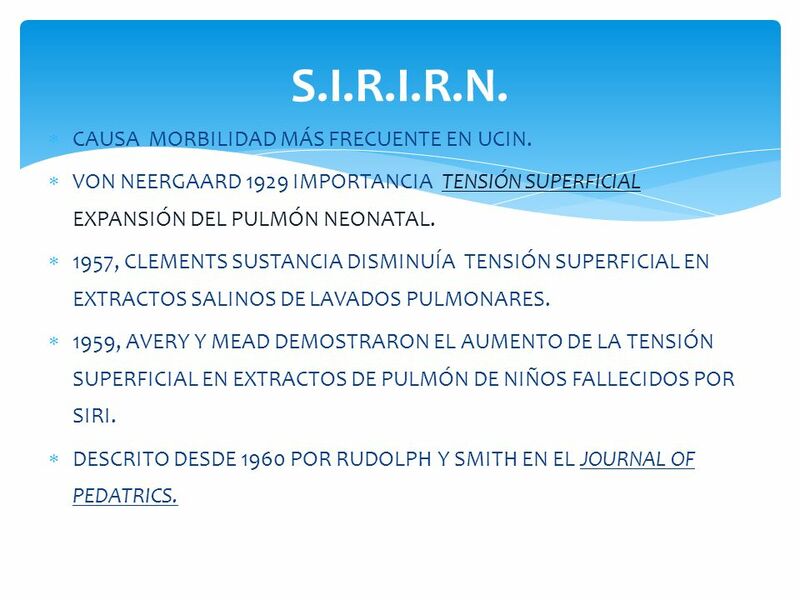 VON NEERGAARD 1929 IMPORTANCIA TENSIÓN SUPERFICIAL EXPANSIÓN DEL PULMÓN NEONATAL. 1957, CLEMENTS SUSTANCIA DISMINUÍA TENSIÓN SUPERFICIAL EN EXTRACTOS SALINOS DE LAVADOS PULMONARES. 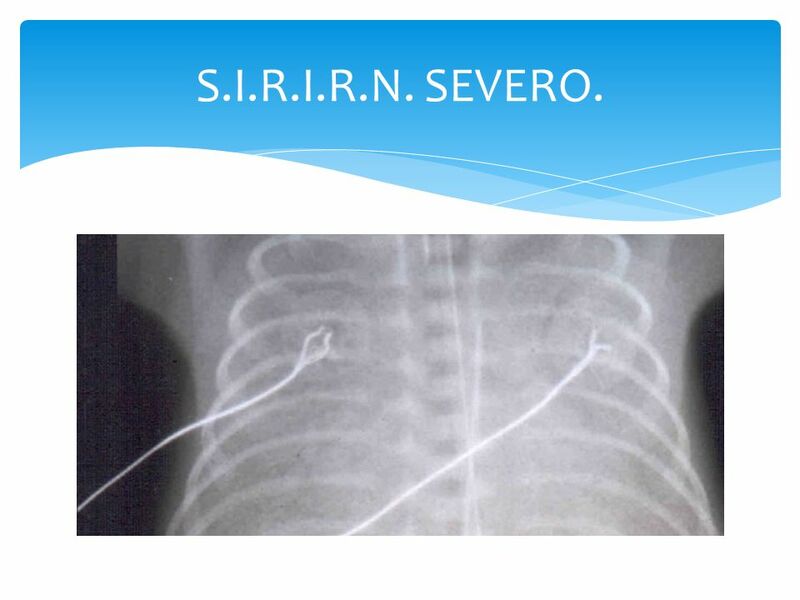 1959, AVERY Y MEAD DEMOSTRARON EL AUMENTO DE LA TENSIÓN SUPERFICIAL EN EXTRACTOS DE PULMÓN DE NIÑOS FALLECIDOS POR SIRI. 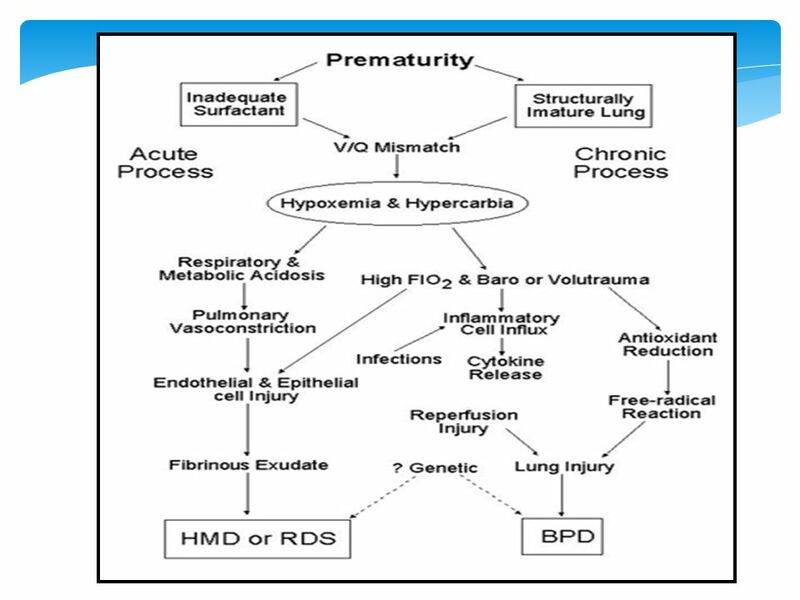 DESCRITO DESDE 1960 POR RUDOLPH Y SMITH EN EL JOURNAL OF PEDATRICS. 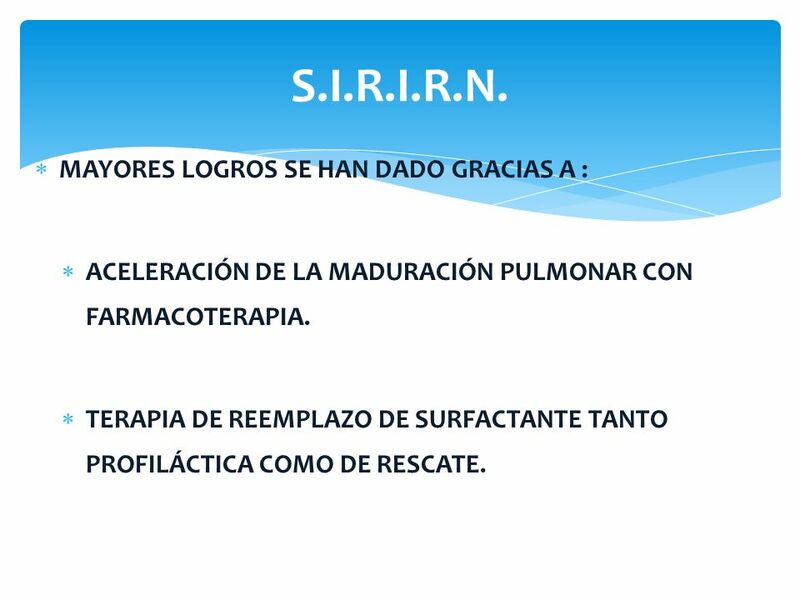 ACELERACIÓN DE LA MADURACIÓN PULMONAR CON FARMACOTERAPIA. 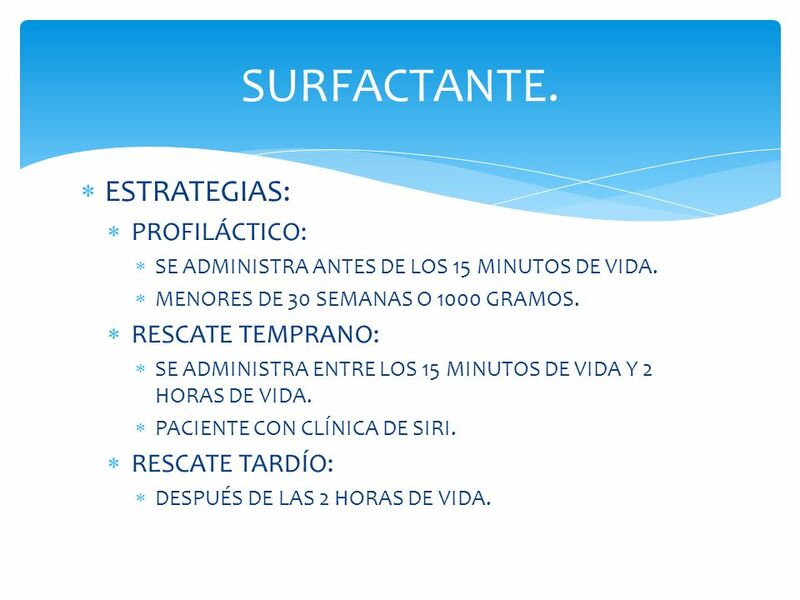 TERAPIA DE REEMPLAZO DE SURFACTANTE TANTO PROFILÁCTICA COMO DE RESCATE. R. N. DE PRETÉRMINO Y CASI TÉRMINO. R. N.BAJO PESO PARA EDAD GESTACIONAL. 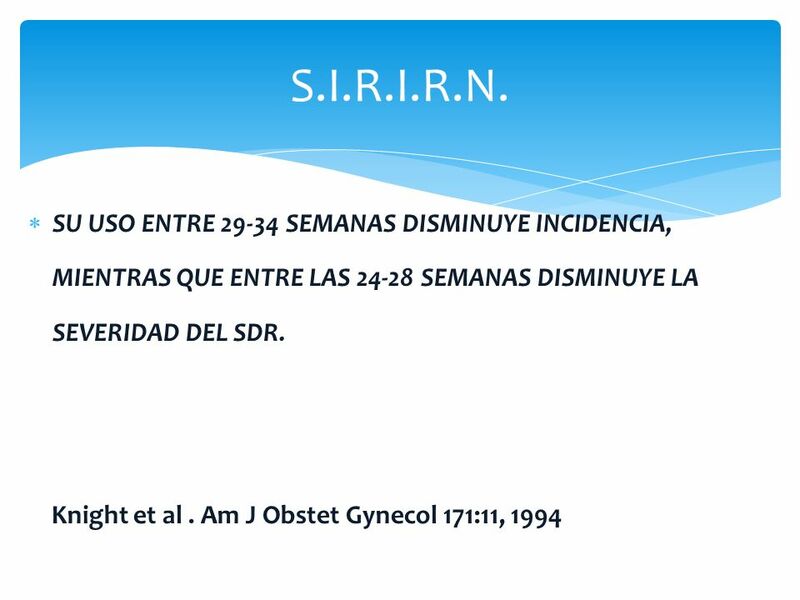 INICIA DISTRESS RESPIRATORIO ENTRE LAS 4-6 HORAS DE NACIDO QUE EMPEORA HACIA LAS 24 HORAS DE EDAD PARA LUEGO ESTABILIZARSE A LAS 48 HORAS Y RESOLVER EN 5-7 DÍAS. 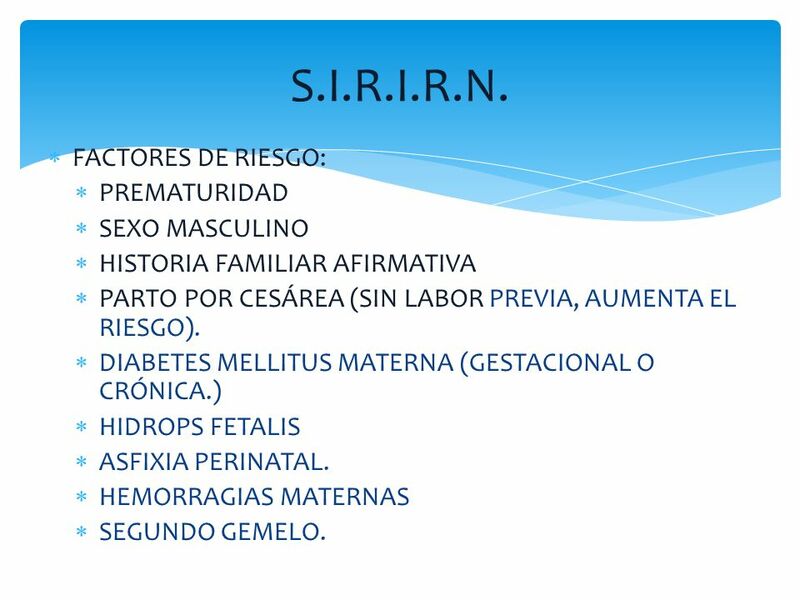 HISTORIA FAMILIAR AFIRMATIVA PARTO POR CESÁREA (SIN LABOR PREVIA, AUMENTA EL RIESGO). DIABETES MELLITUS MATERNA (GESTACIONAL O CRÓNICA.) 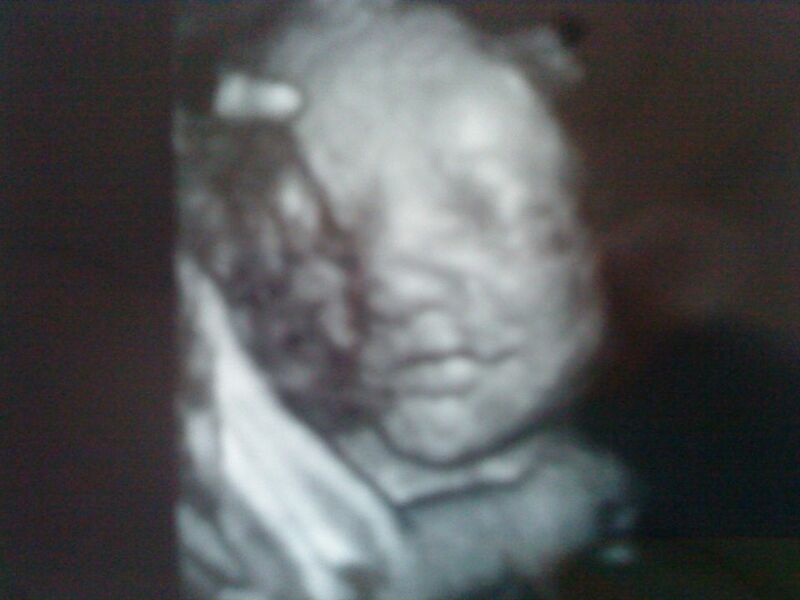 HIDROPS FETALIS ASFIXIA PERINATAL. HEMORRAGIAS MATERNAS SEGUNDO GEMELO. BETAMETASONA 12 MG CADA 24 HORAS # 2 DOSIS DEXAMETASONA 5 MG CADA 12 HORAS # 4 DOSIS. 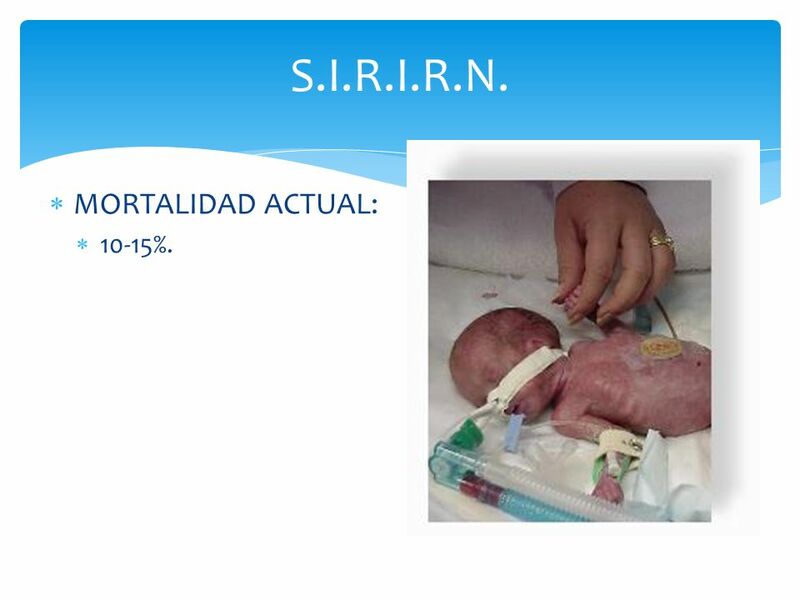 ÚTILES SI SE ADMINISTRAN HORAS ANTES DEL PARTO Y NO MÁS DE 15 DÍAS ANTES DEL MISMO. NO HAY SEGURIDAD USO VARIOS CICLOS. COMPLICACIONES HAN SIDO REPORTADAS. 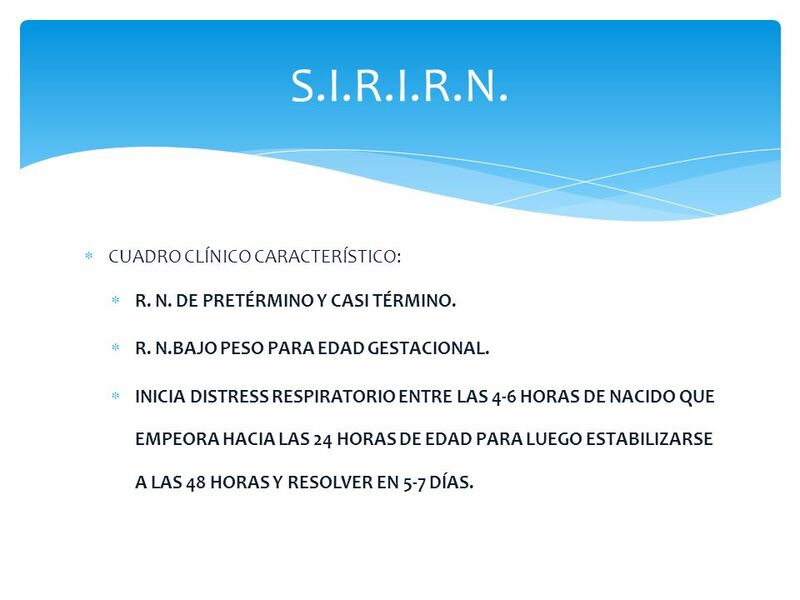 10 S.I.R.I.R.N. 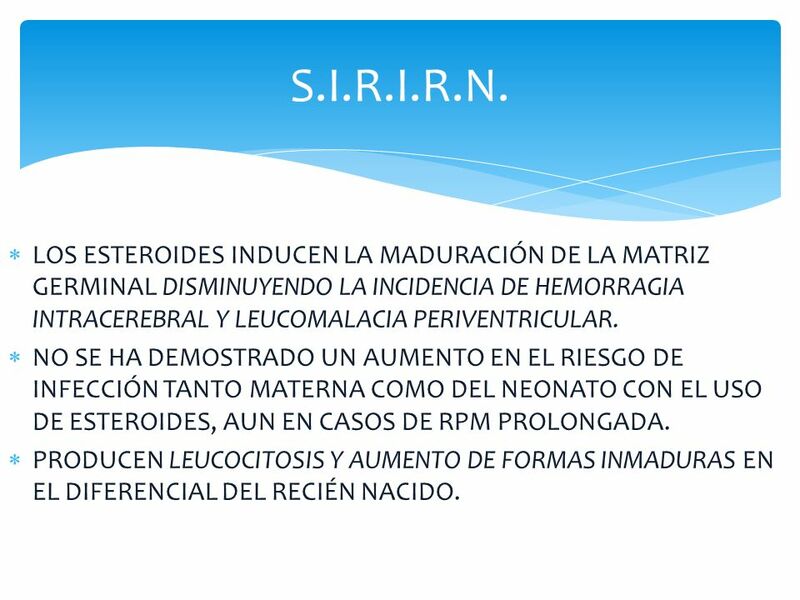 LOS ESTEROIDES INDUCEN LA MADURACIÓN DE LA MATRIZ GERMINAL DISMINUYENDO LA INCIDENCIA DE HEMORRAGIA INTRACEREBRAL Y LEUCOMALACIA PERIVENTRICULAR. 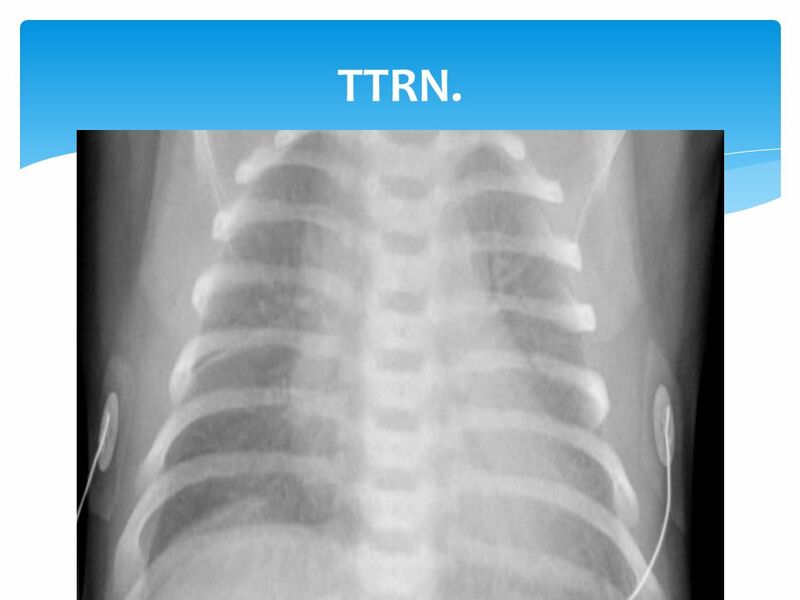 NO SE HA DEMOSTRADO UN AUMENTO EN EL RIESGO DE INFECCIÓN TANTO MATERNA COMO DEL NEONATO CON EL USO DE ESTEROIDES, AUN EN CASOS DE RPM PROLONGADA. 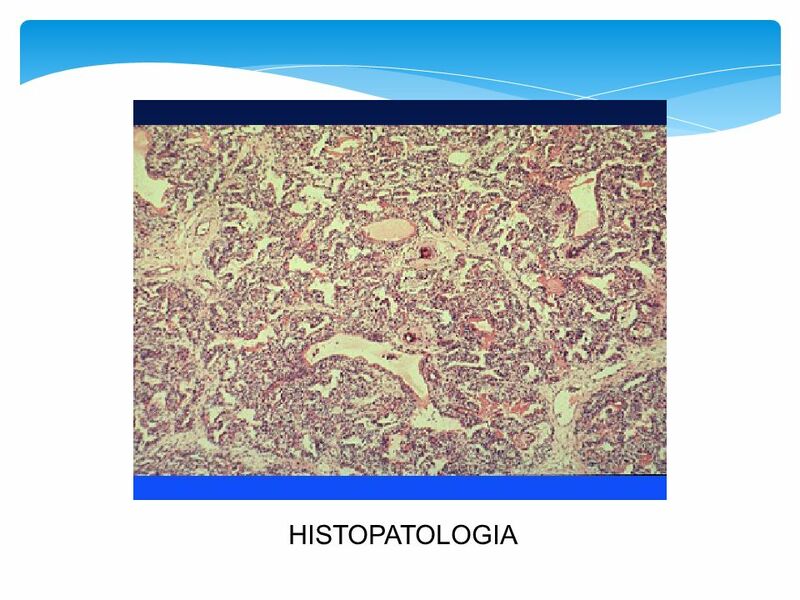 PRODUCEN LEUCOCITOSIS Y AUMENTO DE FORMAS INMADURAS EN EL DIFERENCIAL DEL RECIÉN NACIDO. SE UNEN A RECEPTORES CITOPLASMÁTICOS Y ESTIMULAN SÍNTESIS PROTÉICA CON CITODIFERENCIACIÓN PRECOZ. 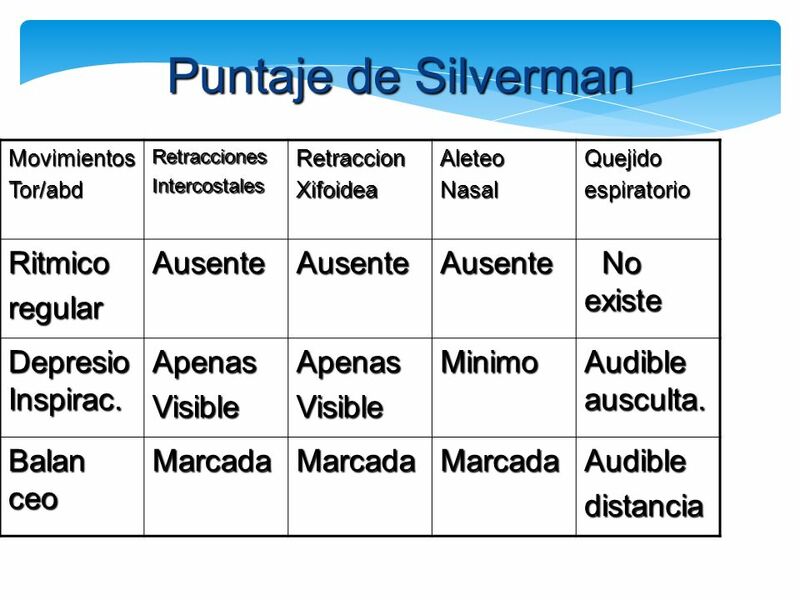 AUMENTO DE VOLUMEN PULMONAR. AUMENTO DE COMPLIANCE. 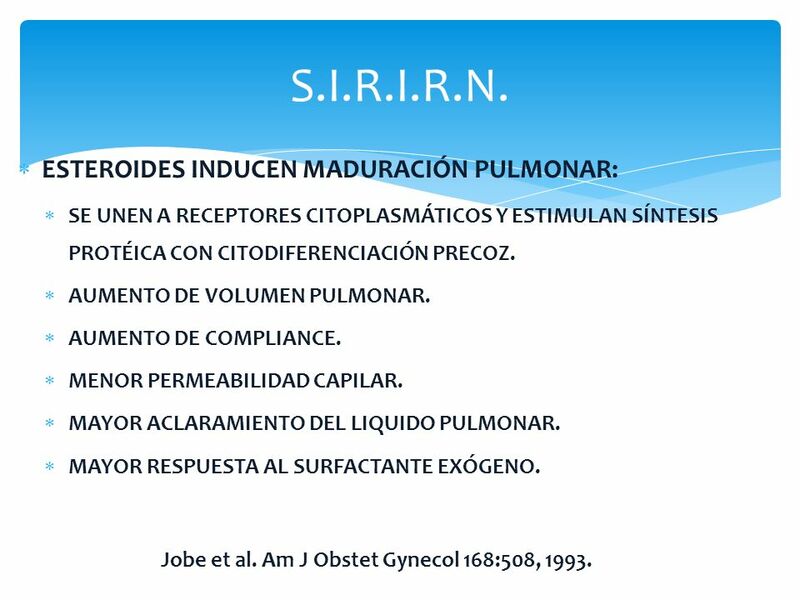 MENOR PERMEABILIDAD CAPILAR. MAYOR ACLARAMIENTO DEL LIQUIDO PULMONAR. MAYOR RESPUESTA AL SURFACTANTE EXÓGENO. Jobe et al. Am J Obstet Gynecol 168:508, 1993. 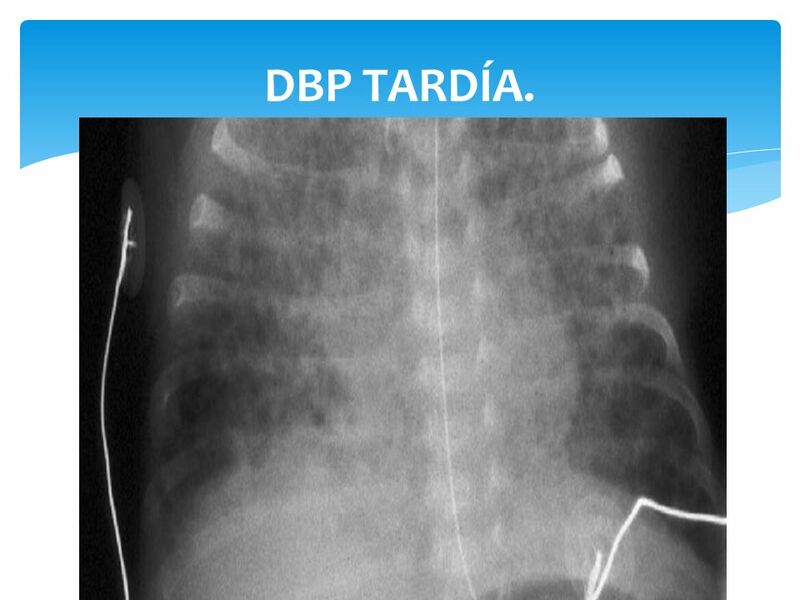 PALIDEZ LLENADO CAPILAR NORMAL EDEMA. HIPOTÓNICO AGITACIÓN POR HIPOXIA. 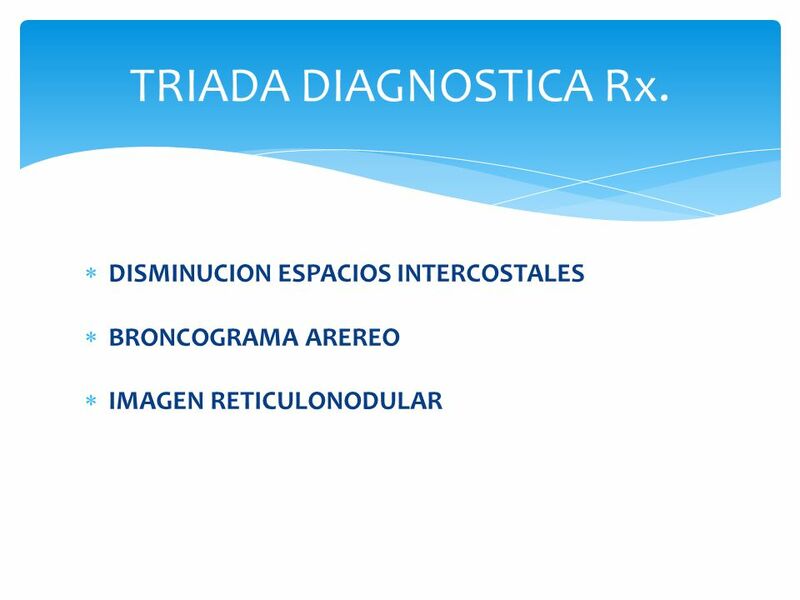 SIGNOS RESPIRATORIOS: TAQUIPNEA > 60 (SUPERFICIAL) APNEAS QUEJIDO ESPIRATORIO RETRACCIONES INTERSCOSTALES Y SUPRAESTERNALES. ALETEO NASAL. BAMBOLEO TORACO ABDOMINAL. FC: HIPOTENSIÓN. SOPLOS SISTÓLICOS. CIANOSIS. SNC: HIPOTÓNICO FONTANELAS NORMALES. 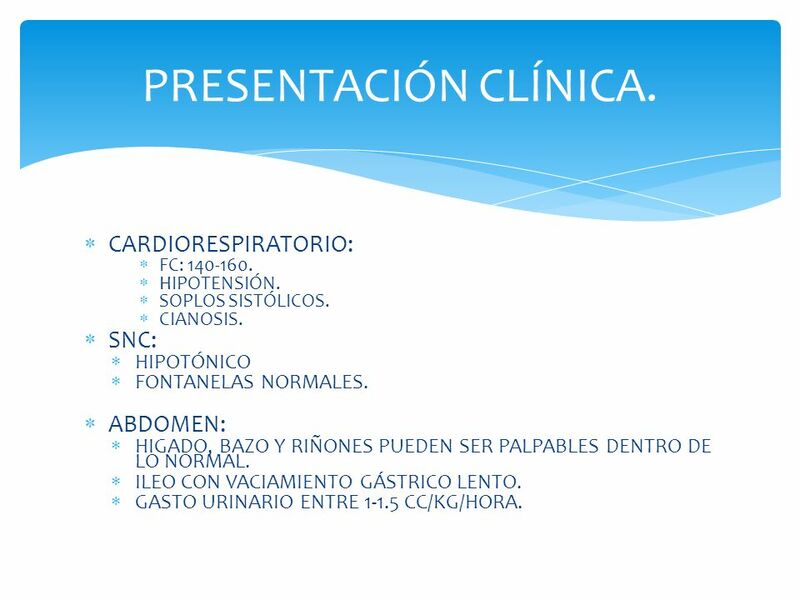 ABDOMEN: HIGADO, BAZO Y RIÑONES PUEDEN SER PALPABLES DENTRO DE LO NORMAL. ILEO CON VACIAMIENTO GÁSTRICO LENTO. GASTO URINARIO ENTRE CC/KG/HORA. 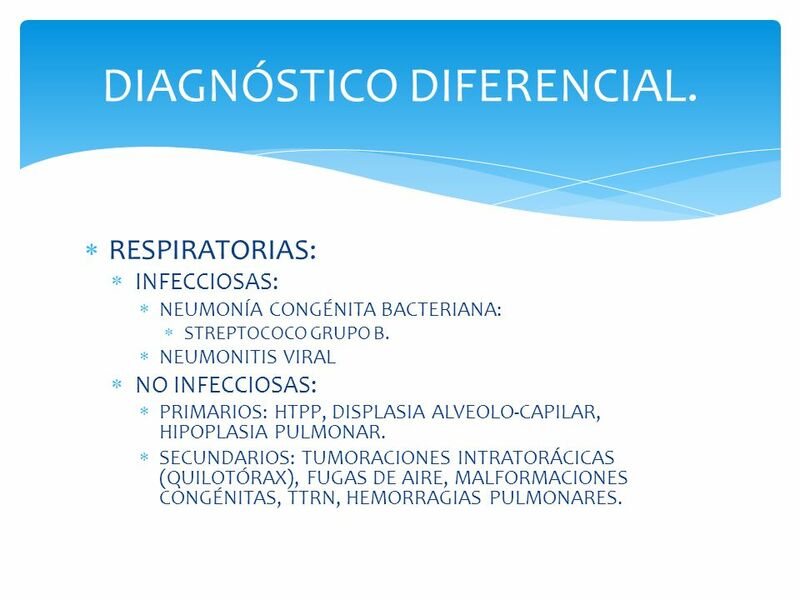 RESPIRATORIAS: INFECCIOSAS: NEUMONÍA CONGÉNITA BACTERIANA: STREPTOCOCO GRUPO B. NEUMONITIS VIRAL NO INFECCIOSAS: PRIMARIOS: HTPP, DISPLASIA ALVEOLO-CAPILAR, HIPOPLASIA PULMONAR. SECUNDARIOS: TUMORACIONES INTRATORÁCICAS (QUILOTÓRAX), FUGAS DE AIRE, MALFORMACIONES CONGÉNITAS, TTRN, HEMORRAGIAS PULMONARES. 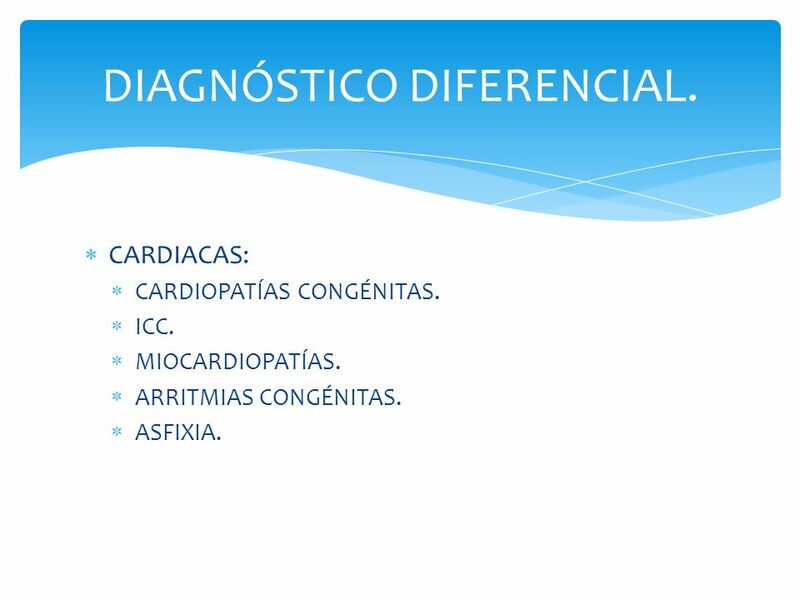 CARDIACAS: CARDIOPATÍAS CONGÉNITAS. ICC. 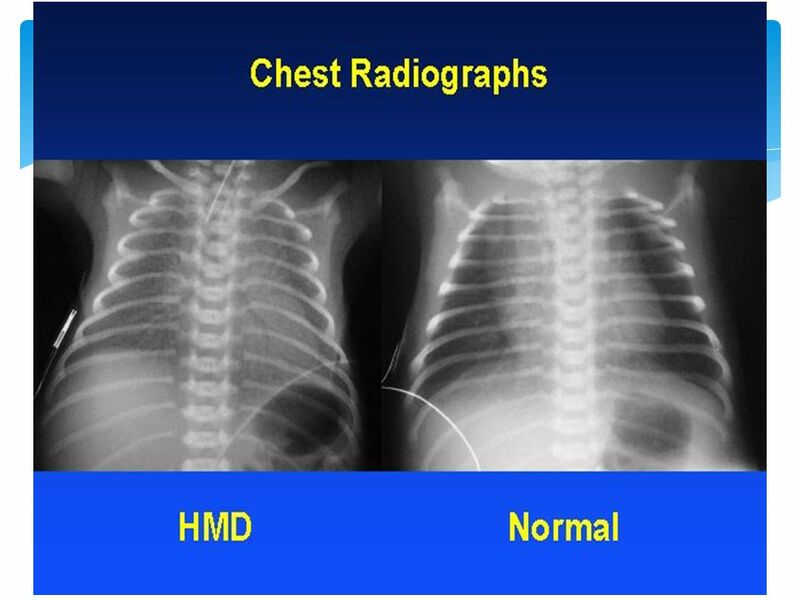 MIOCARDIOPATÍAS. ARRITMIAS CONGÉNITAS. ASFIXIA. 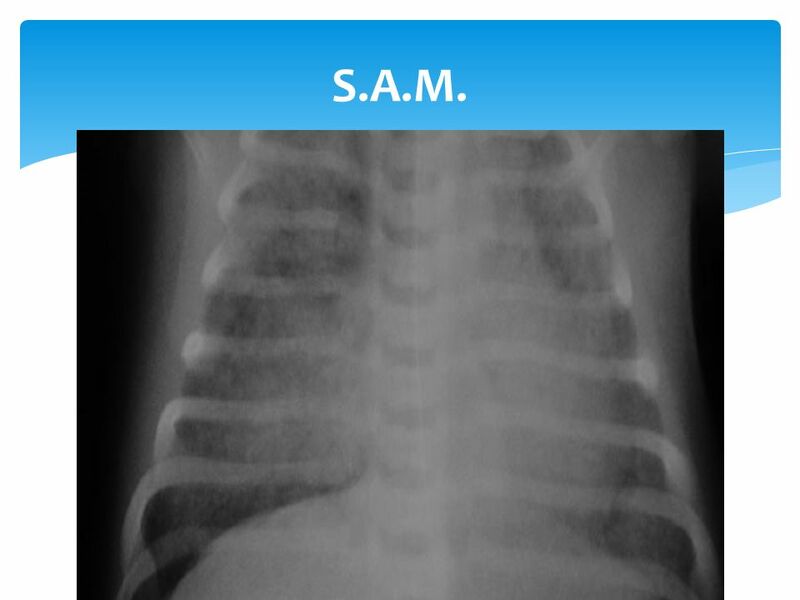 ANEMIA, TROMBOCITOPENIA. BIOQUÍMICA: ALTERACIONES POR PREMATURIDAD. 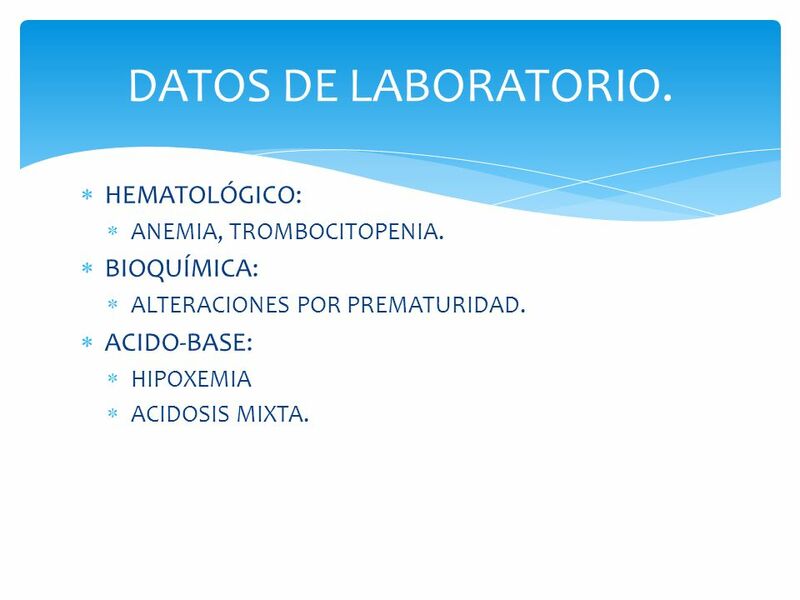 ACIDO-BASE: HIPOXEMIA ACIDOSIS MIXTA. 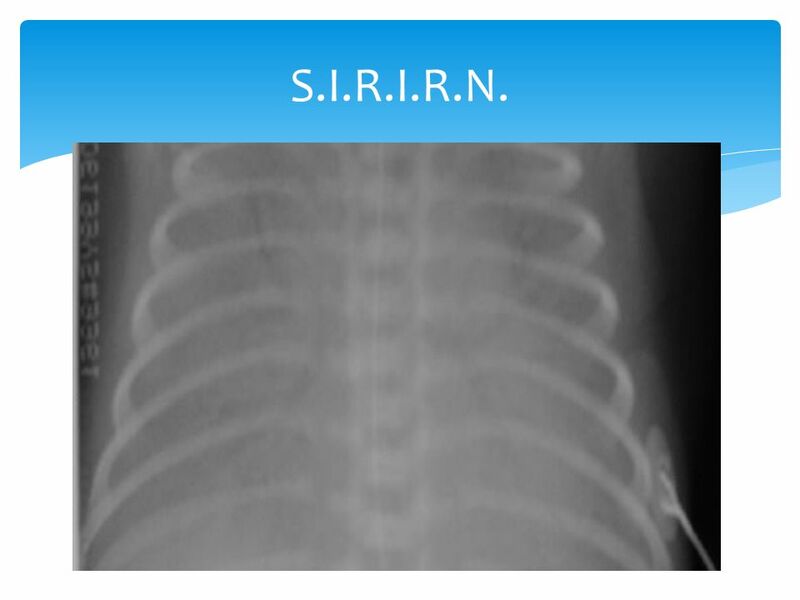 20 RADIOLOGÍA. APARECEN DATOS A LAS 3-4 HORAS. 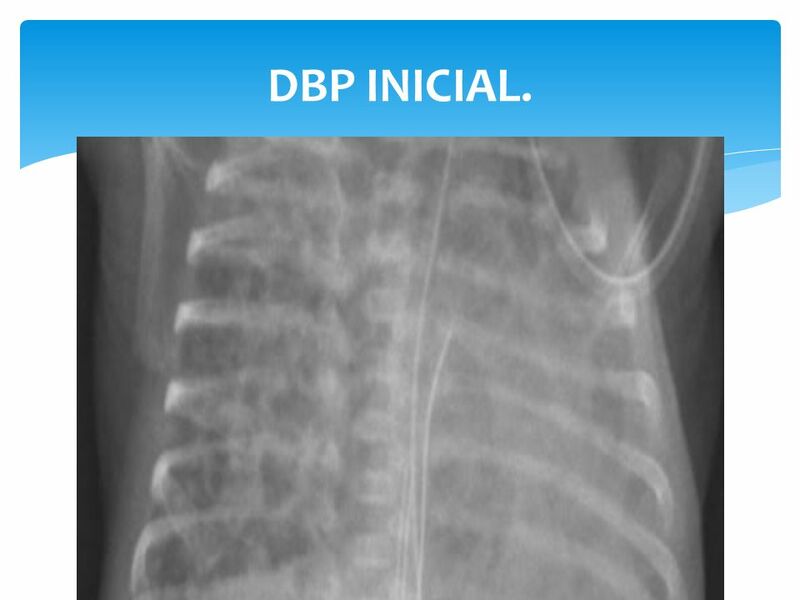 POBRE VOLUMEN PULMONAR. 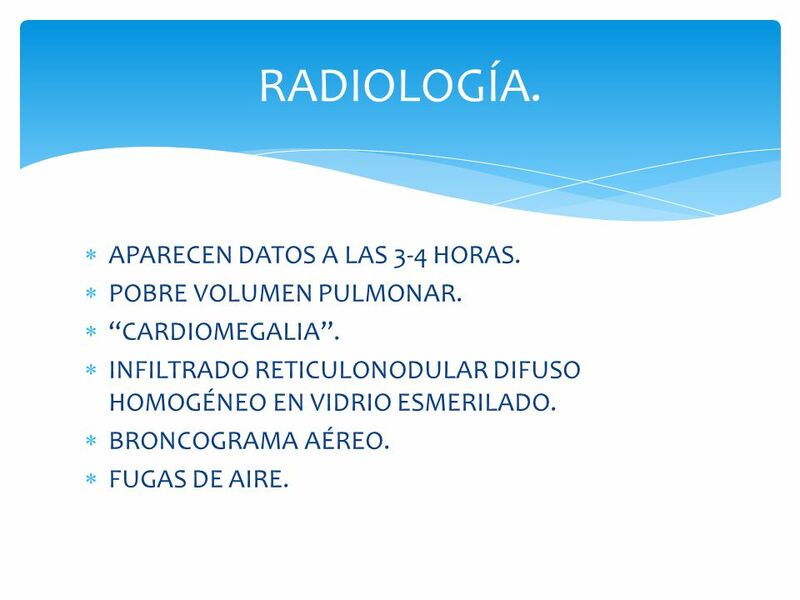 “CARDIOMEGALIA”. 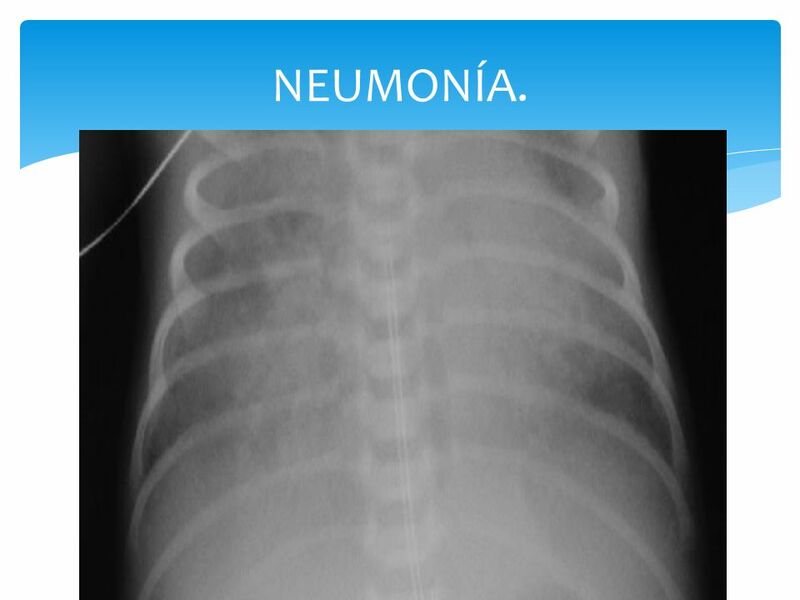 INFILTRADO RETICULONODULAR DIFUSO HOMOGÉNEO EN VIDRIO ESMERILADO. BRONCOGRAMA AÉREO. FUGAS DE AIRE. 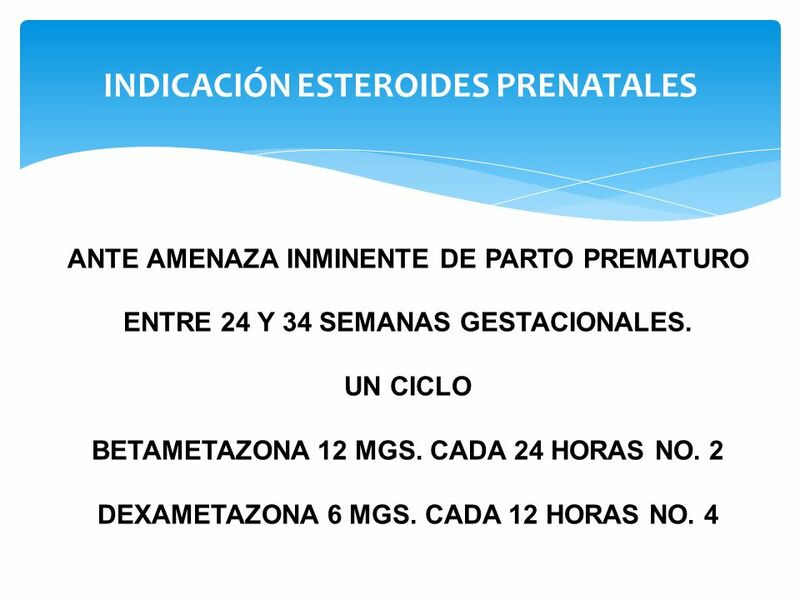 CONTROL PRENATAL ADECUADO. SEGUIMIENTO ADECUADO DE CASOS DE ALTO RIESGO. MANEJO DE LA UTEROINHIBICIÓN EN APP. ESTEROIDES ANTENATALES. 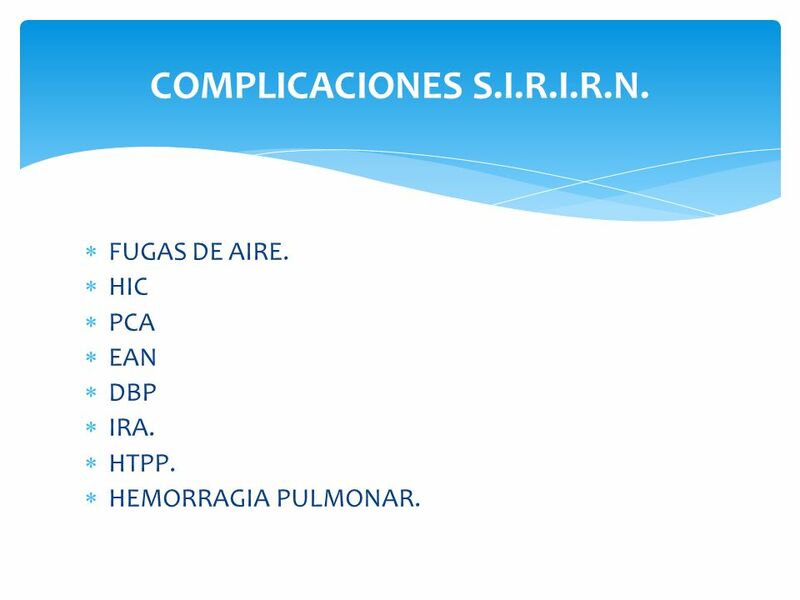 REANIMACIÓN EFECTIVA, RÁPIDA Y AGRESIVA DEL RN EN RIESGO. EVITAR LA ASFIXIA PERINATAL. 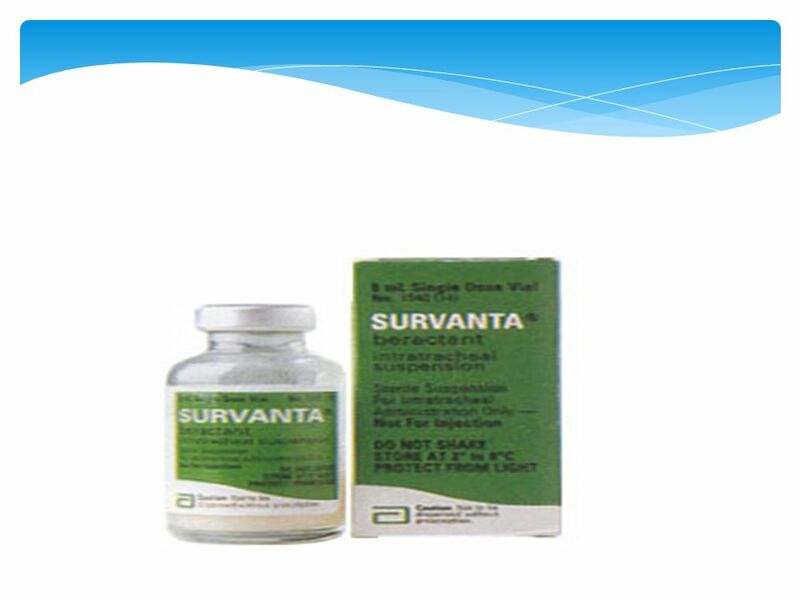 SURFACTANTE PROFILÁCTICO O DE RESCATE TEMPRANO. ESTABILIZACIÓN. MANEJO DE EQUILIBRIO HIDROELECTROLÍTICO. 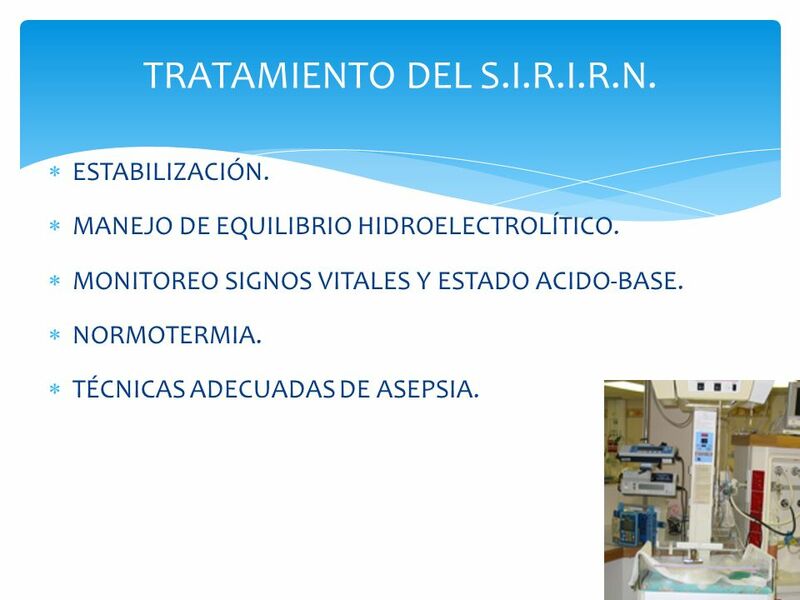 MONITOREO SIGNOS VITALES Y ESTADO ACIDO-BASE. 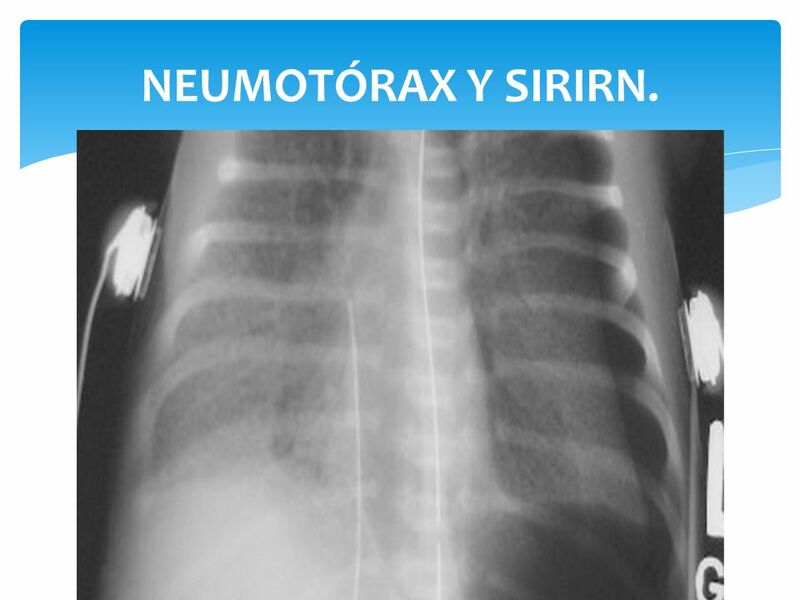 NORMOTERMIA. TÉCNICAS ADECUADAS DE ASEPSIA. 24 TRATAMIENTO DEL SIRI. MANEJO VENTILATORIO: OXIGENO SUPLEMENTARIO. 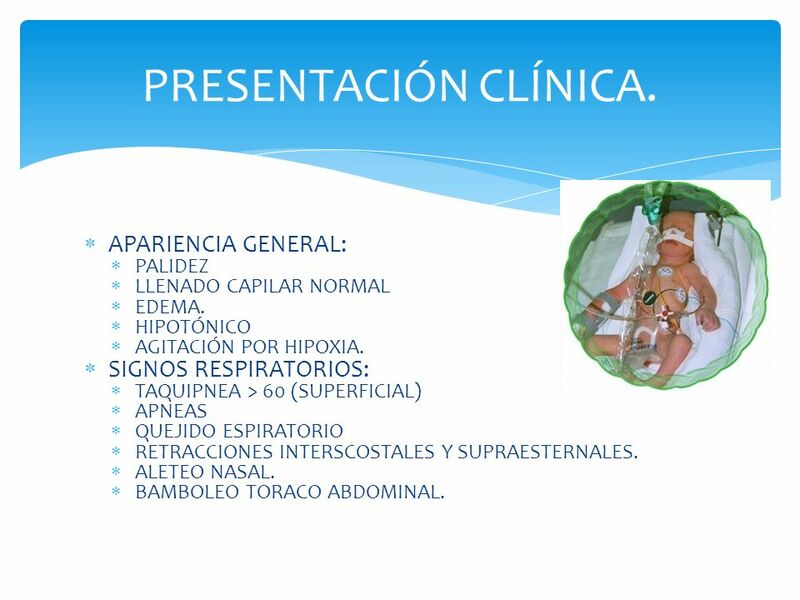 CPAP NASAL. 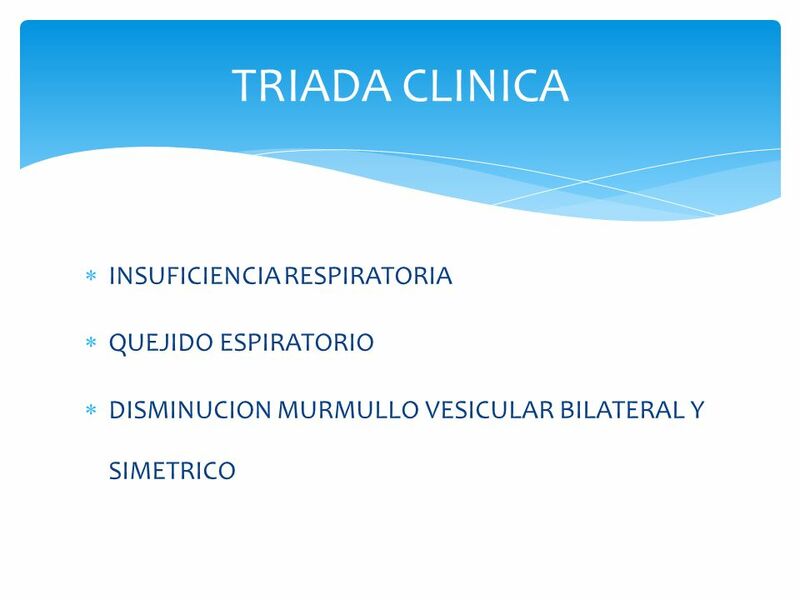 VENTILACIÓN MECÁNICA CONVENCIONAL. 25 SURFACTANTE. 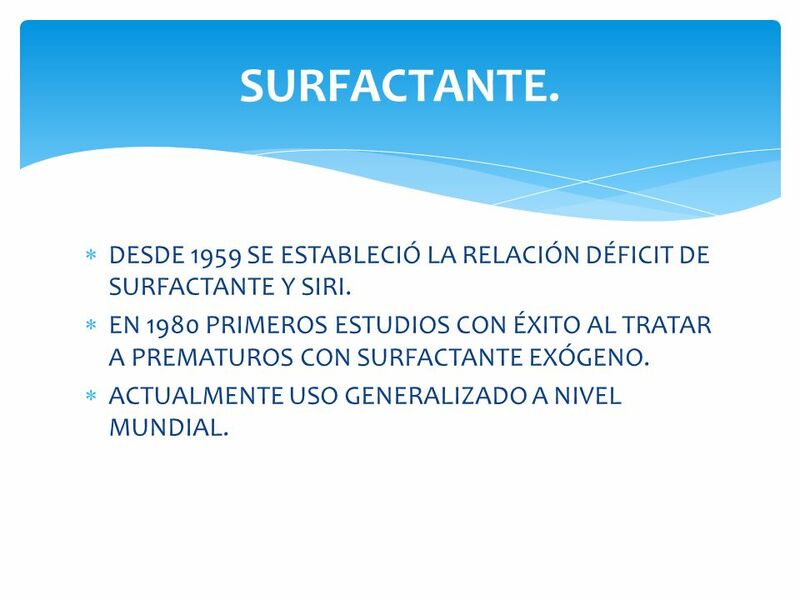 DESDE 1959 SE ESTABLECIÓ LA RELACIÓN DÉFICIT DE SURFACTANTE Y SIRI. EN 1980 PRIMEROS ESTUDIOS CON ÉXITO AL TRATAR A PREMATUROS CON SURFACTANTE EXÓGENO. ACTUALMENTE USO GENERALIZADO A NIVEL MUNDIAL. 26 SURFACTANTE. MEJORA LA COMPLIANCE PULMONAR. EVITA COLAPSO ALVEOLAR DURANTE LA ESPIRACIÓN AL DISMINUIR AL TENSIÓN SUPERFICIAL. DISMINUYE RIESGO FUGAS DE AIRE. DISMINUYE MORTALIDAD. SE ADMINISTRA ANTES DE LOS 15 MINUTOS DE VIDA. MENORES DE 30 SEMANAS O 1000 GRAMOS. RESCATE TEMPRANO: SE ADMINISTRA ENTRE LOS 15 MINUTOS DE VIDA Y 2 HORAS DE VIDA. 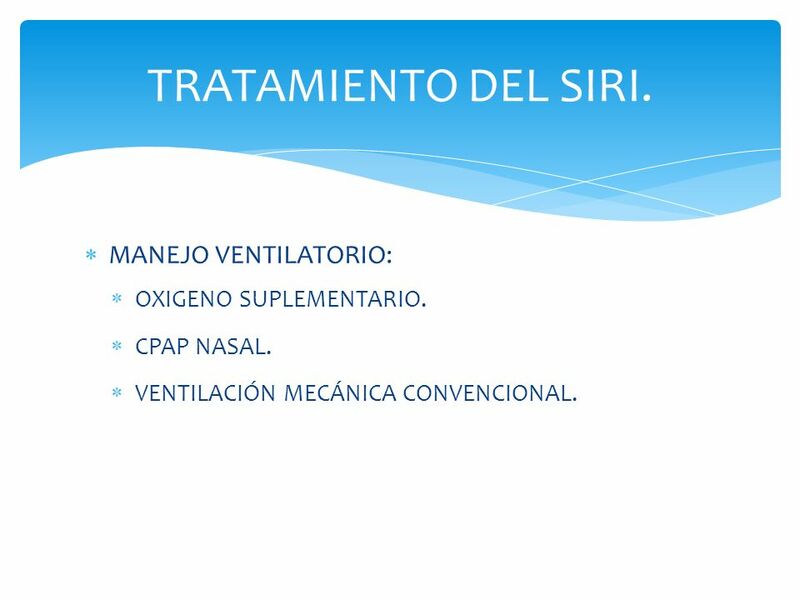 PACIENTE CON CLÍNICA DE SIRI. RESCATE TARDÍO: DESPUÉS DE LAS 2 HORAS DE VIDA. FUGAS DE AIRE. HIC PCA EAN DBP IRA. HTPP. 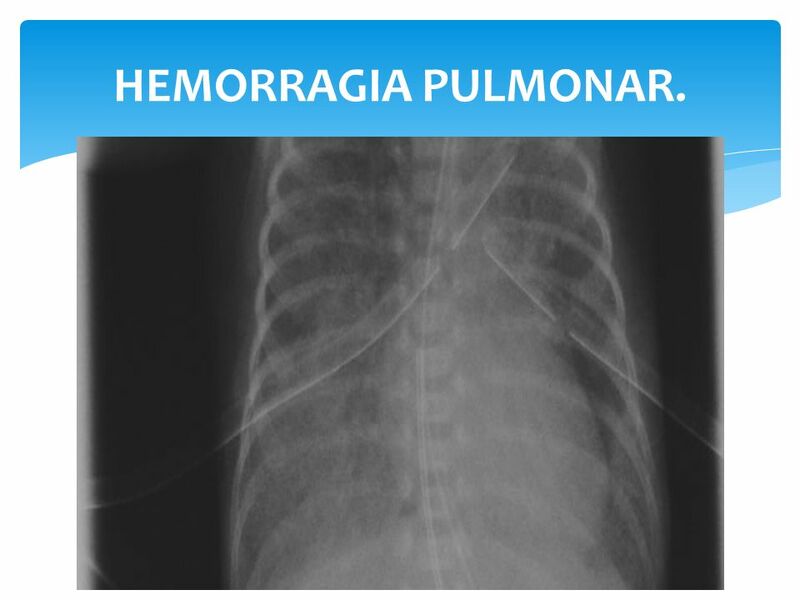 HEMORRAGIA PULMONAR. 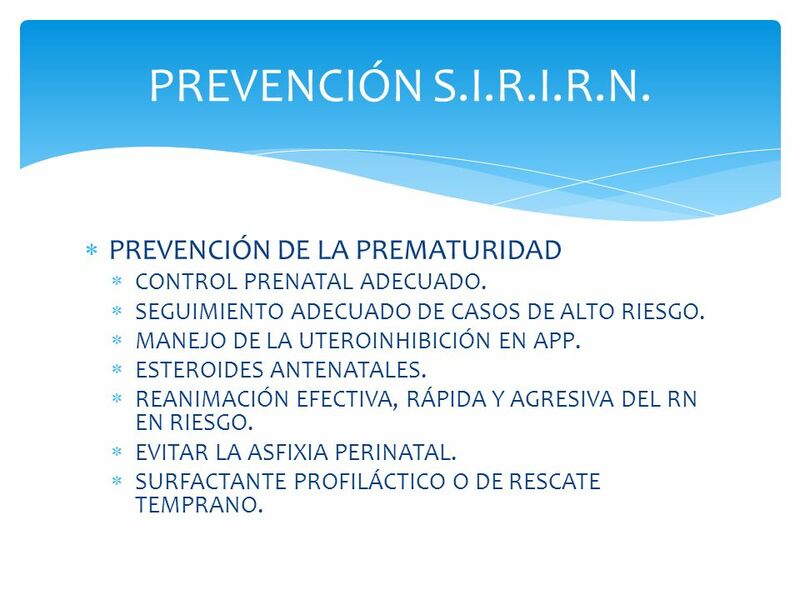 30 S.I.R.I.R.N. MORTALIDAD ACTUAL: 10-15%. 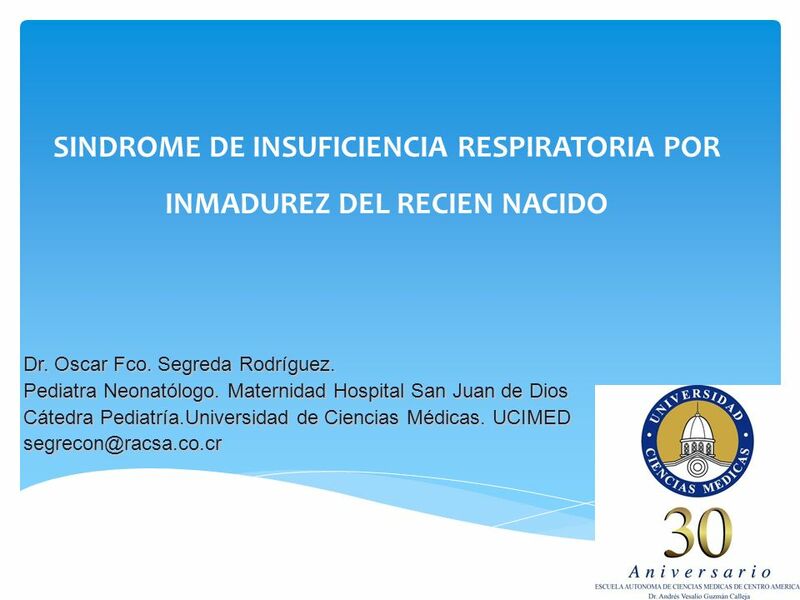 Descargar ppt "SINDROME DE INSUFICIENCIA RESPIRATORIA POR INMADUREZ DEL RECIEN NACIDO"
SINDROME DE INSUFICIENCIA RESPIRATORIA POR INMADUREZ. Se edita por el menú Insertar, Número de Diapositiva... 1. 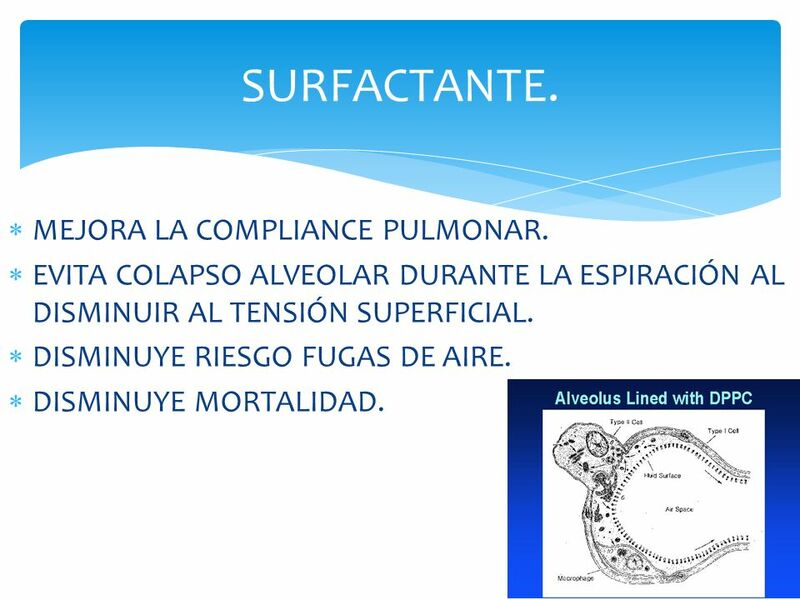 Surfactantes Previene el colapso alveolar al disminuir la tensión superficial: favorece la expansión pulmonar en la inspiración Produce efecto antiedematoso.